St. John v. US Department of Justice et al. The subject matter jurisdiction of the United States District Court for the Southern District of New York is properly based on consideration of both federal questions (28 USC § 1331) and diversity of citizenship (28 USC § 1332). Allegations are made of fraud (18 USC § 35); conspiracy to commit fraud (18 USC § 371); obstruction of justice (18 USC § 1512(c)); treason (Constitution of the United States, Article III, Section 3; 18 USC § 2381, 2382, 2384); and initiating aggressive war (18 USC § 2441; Nüremberg Principles, VI(a); Charter of the United Nations, Article 2.4; Constitution of the United States, Article IV, Supremacy Clause ) by employees of the United States Department of Justice and others as yet unidentified, including foreign nationals and United States nationals with dual citizenship. These crimes were carried out in Herndon, Virginia; Alexandria, Virginia; Washington, District of Columbia; New York, New York; and other parts as yet unknown. The jurisdiction of the United States Court of Appeals for the 2nd Circuit is proper because the subject matter encompasses the very same federal questions and diversity of citizenship which were brought before the United States Court for the Southern District of New York; because the lower court is within the 2nd Circuit (28 USC § 1294(1)); and because Chief Judge Loretta A. Preska issued a Certificate of Appealability with respect to her final decision (28 USC § 1291). Remedy is from Amendments IX and X of the Constitution of the United States. The two main issues now before this Court are (1) the lower court’s legally correct finding that the Plaintiff-Appellant does not have standing to sue because he did not demonstrate actual damage, and (2) the unique and compelling set of special circumstances that, as the Plaintiff-Appellant will show in the following sections of this brief, is entirely without precedent and cries out for this suit to proceed in the best interests of justice and the national security of the United States of America. The Plaintiff-Appellant dares not challenge the erudition and logic of the Chief Judge of the District Court, but rather will draw his legal sword and shield from the reservoir of unspecified rights guaranteed by the supreme law of the land, the Constitution of the United States, in Amendments IX and X. A citizen who in good faith alerts his government with evidence of serious wrongdoing has a right to a direct and forthright response from that government rather than a conspiracy of silence and of shunning. But when the chief law enforcement agency perpetrated the serious wrongdoing, that citizen’s actions can become somewhat complicated. It is simply preposterous to hold that the Plaintiff-Appellant’s failure to demonstrate actual damages is a sound legal basis to avoid an adversarial process that conduces toward discovery of an important truth about 9/11; namely, that our nation’s principal investigative and law enforcement agency used a bogus “Dulles Airport” video surveillance tape to frame certain Arabs for the heinous crimes of 9/11. This treasonous crime served to create a pretext for unjustified wars. Our Constitution of the United States is resilient enough to permit an exception in a most extraordinary circumstance where a private citizen of the United States undertakes to uphold the rule of law and the good name and reputation of his nation when no one else could or would or will. As a former employee of the US Department of Commerce, the Plaintiff-Appellant remains bound to his solemn affirmation to preserve, protect and defend the Constitution of the United States. There were no known proceedings in the District Court involving the Defendants-Appellees in this action prior to Chief Judge Preska’s sua sponte civil judgment and order of dismissal, so there is no transcript of proceedings or agreed statement of the record on appeal. Therefore, in this case this Court has a tabula rasa for creative and innovative solutions. Given the global implications of dissolving a very strong delusion about 9/11 and the real reasons for the carnage and destruction in Afghanistan and Iraq, this Court should consider this brief en banc. 2. Also, I am an eyewitness to the attacks on New York on 11 September 2001. I was approaching the Brooklyn Bridge subway station on a Lexington Avenue express train when the north Twin Tower was hit and then was inside the Federal Building at 26 Federal Plaza on the 30th floor when the second attack occurred. Back then I served as a part-time Field Representative with the United States Department of Commerce in the Survey Division of the Bureau of the Census. Most of my work was conducted in the field from my residence on the Upper East Side of Manhattan. But each day that unforgettable week I was scheduled to attend classroom training at the New York Regional Office for a new survey sponsored by the Centers for Disease Control and Prevention. 3. My boss, our Assistant Regional Director of the New York Regional Office, Marion Britton, was also a witness to what happened, but we will never hear from her because she was reported to have perished on board United Airlines Flight 93 from Newark to San Francisco where she was to attend a Census Bureau conference. I saw Marion for the very last time the previous day when we greeted each other in a hallway. However, the lack of routine video surveillance evidence showing her at Newark Liberty International Airport on the morning of 9/11 aroused my suspicions and eventually put my focus on the general lack of credible 9/11 video surveillance evidence of any of the passengers or alleged hijackers at all three airports from which the flights of 9/11 are said to have departed. This special interest generated on behalf of my departed boss culminated in my discovery of the bogus 9/11 “Dulles Airport” video which is the subject matter of this suit. I know Marion would thank me for my efforts if she could. She taught me the virtues of persistence and patience by managing waiting time. I believe she’d be impressed! 4. Another colleague at the Census Bureau, whom I shall call “Witness X” because of privacy concerns, told me within days of the attacks what he saw and heard, and it was his testimony that also propelled me to look deeper into the matter. Witness X’s desk was about 20 feet from a window giving a view of the World Trade Center just four tenths (0.4) of a mile away. He told me that at the very beginning of the attacks he heard and felt two loud explosions about ten seconds apart. Then, minutes later, he saw the second jet crossing New York harbor in an attitude he said he will never forget; namely, one wing pointed almost straight up to the sky and the other almost straight down to earth. He watched in horror as the jet leveled in its approach and then smashed into the south tower WTC2. What Witness X heard and saw that morning has been corroborated by many other credible witnesses but nevertheless steadfastly omitted from the official account of what happened. All of these spurned testimonies lead to other conclusions; namely, remote control piloting of the jets and explosives planted inside the buildings, some of which were imperfectly synchronized with the attacking jets. 5. My avid interest in finding out the truth of what really happened on 9/11, and exposing the lies and the cover-up, led me to research and write numerous articles, including 60 Open Letters on 9/11 to the Attorney General of the USA Michael B. Mukasey (published on my website at www.show-the-house.com/id54.html) and 18 Open Letters on 9/11 to the Attorney General of the USA Eric Holder (published at www.show-the-house.com/id79.html). Each of these letters, and many other articles besides, was faxed to every member of the United States Congress, both Senate and House, nearly every embassy in Washington, nearly every mission to the United Nations in New York City, and many other institutions and individuals, both public and private. Responses, though few and far between, were encouraging. But perhaps needless to say, I never heard back from Mukasey or Holder or any of my elected federal, state and local officials. These letters point to many topics for a new and real investigation. 6. I did have some solace, however, when Thomas H. Kean and Lee H. Hamilton, the Co-Chairmen of the 9/11 Commission that produced the 9/11 Commission Report, published their own book Without Precedent in which they admitted that they were “set up to fail” in their investigation of 9/11. Let me here add that the bogus 9/11 “Dulles Airport” video surveillance tape made its first appearance on TV on 21 July 2004, the night before the publisher’s release of their 9/11 Commission Report. This public relations stunt to hoodwink the public and increase book sales only underscores the need to regard the report as a false and misleading document and an integral part of the cover-up of very serious crimes including treason and war crimes. The best critic of the 9/11 Commission Report is David Ray Griffin, whose several books on 9/11 I recommend and regard as an excellent foundation for a real investigation. Griffin’s meticulous work and logical conclusions already constitute an invaluable service to our nation. 7. For the Court’s information I point out that the South Carolina law firm Motley Rice LLC allegedly provided the bogus 9/11 “Dulles Airport” video surveillance tape to the media. My email to founding partner Joseph Rice was not returned. Also, the late, great Internet investigative journalist, Joe Vialls, had incredibly speedy access to this tape, but his exposé of fraud turned out to be a misdirection for 9/11 truth seekers. Other researchers believe Joe Vialls is really Ari Ben Menashe, the Israeli intelligence officer of “Iran Contra” fame and an Iranian Jew posing as an ostensibly anti-Semitic Australian. With the possible exception of Kenneth R. Feinberg, the Special Master who administered the September 11th Victim Compensation Fund, Vialls was foremost in arresting the discovery process with respect to the bogus 9/11 “Dulles Airport” video tape. 8. I should also point out for the sake of full disclosure that the attacks of 9/11 canceled for the very first time in history the annual Judicial Conference that Chief Justice William H. Rehnquist had just convened inside the Supreme Court building that very morning. At that time, the Judicial Council of the 11th Circuit had already been entertaining for an extraordinary length of time my petition for review of the Chief Judge’s dismissal of my complaint of judicial misconduct that touched on the related matters of the USS Liberty incident; the nearly simultaneous and incredibly fast taking of the Syrian Golan Heights in less than 24 hours near the end of what is now known as the Six Day War of June 1967; and our government’s feckless quest for real peace in the Middle East ever since Herbert Hoover advocated “transfer” of Palestinians out of Palestine to make room for the Zionists. (RE: Miscellaneous Number 01-0030, IN THE MATTER OF: Stephen M. St. John) The possibility therefore existed within the law (28 USC §372(c)) that the 11th Circuit chief judges might refer this sensitive matter to the Judicial Conference even without notice to me, the complainant-petitioner, or to the complained-of judge. This real possibility raised two other possibilities, depending on one’s point of view; namely, an extraordinary public relations coup for the survivors of the USS Liberty, their families, friends and supporters in their long quest for truth and justice, or a totally unacceptable public relations disaster for the Zionists which would put at risk both their public support in the USA and their capacity to control or at least influence the USA’s foreign policy deliberations. And so what loomed as a real possibility was also regarded as an existential threat and an unacceptable risk. Well, I certainly don’t know what the two chief judges from the 11th Circuit were thinking that morning at the Judicial Conference inside the Supreme Court building, but I do know for sure that the attacks of 9/11 erased both of the two aforementioned possibilities. And I also know for sure that Prime Minister Benjamin Netanyahu is not kidding when he says – as he has said more than once - “9/11 was good for Israel.” Indeed, the existential threat and unacceptable risk had been removed by the attacks of 9/11, and his Likud doctrine, which goes hand in hand with the Zionist Neoconservative ideology in the USA, finally turned into an action program. Netanyahu’s shameful remark that “9/11 was good for Israel” can be accurately put into a certain context that is troubling indeed for those who honestly consider motives, means and opportunities. I have endeavored to do this in my article Did Laughter of the Judges make the World Trade Center Towers 1, 2 & 7 fall on 9/11? This is also published at www.show-the-house.com/id18.html. 9. By July 2009 three conditions had finally converged to make it possible for me to double check the false and misleading 2004 claim of “Joe Vialls” that the shadows seen in the far background of the “Dulles Airport” video surveillance tape indicated late morning or early noon at Dulles Airport (38° 57' North, 77° 27' West) and not the early morning hour when the alleged terrorists supposedly arrived at Dulles to initiate their terrorist acts. One, the US District Court for the Eastern District of Virginia had published the video on its website after Zacharias Moussaoui’s 2006 trial and I was able to download it in 2009. Two, I had purchased a powerful new Hewlett Packard laptop computer with Windows Vista Ultimate software which provides a “Snipping Tool” for copying any image or part thereof appearing on a computer screen. Three, I had played with the truly outstanding Google Earth software long enough to realize I could get satellite pictures of Dulles Airport; see how the airport terminals are oriented with the runways which have directional headings; and then determine at what angle to the Main Terminal entrance the sun’s shadows point on a September morning. I concluded that if the video were indeed authentic, then the sun rose in the west on the morning of 9/11. What any competent analyst could have figured out well before the USA invaded Afghanistan, it took me nearly eight full years! 10. My discovery of the bogus 9/11 “Dulles Airport” surveillance video did not raise my hope that I would finally pierce my fellow Americans’ conspiracy of silence and of shunning. With the opening of the new United Nations General Assembly approaching in September 2009, I conducted a letter writing campaign by fax and email to nearly every head of state or head of government on this earth. Each received a copy of my article 9/11: Another Look (published on my website at www.show-the-house.com/id91.html) and most also received a copy of “Dulles Airport” Shadow casts Doubt on US Government’s 9/11 Conspiracy Theory as well (www.show-the-house.com/id92.html). I urged each ruler or official to use the podium in the General Assembly hall in New York City to call for a United Nations International Independent Investigation of 9/11 and I also offered my services in this endeavor. The Defendants/Appellees among others also received copies in this time frame. 12. Citizen of the USA Stephen M. St. John addresses the international community here in New York and has the honor to file in this fax broadcast a notice of claim before the Chief Judge of the United States District Court, Southern District of New York, Loretta A. Preska, for a reward of $50,000,000 for his having uncovered the culprits behind the 9/11 frame-up and cover-up. Such an amount is commensurate with previous offers of rewards for bringing in certain 9/11 suspects “dead or alive” and is a fair return for pointing to the real purveyors of the shock and awe doctrine on 9/11, their false flag military intelligence operations and the full spectrum fraud behind their full spectrum force. Having been stonewalled by the Obama Administration, which is now staking Afghanistan’s future on derivatives of the BIG LIE of 9/11, Citizen St. John asks the court to examine in every detail his article “Dulles Shadow casts Doubt on the US Government’s 9/11 Conspiracy Theory” published on his website at http://www.show-the-house.com/id92.html. 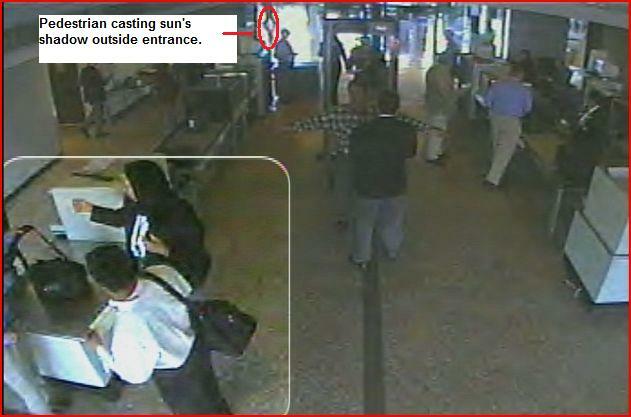 Working with a purported Dulles Airport video surveillance tape of five Arab hijackers on the morning of 9/11, which was admitted as evidence by Judge Leonie Brinkema at the trial of Zacharias Moussaoui, analysis of the sun’s shadow cast by a passerby outside the terminal door led to the conclusion that the film is bogus; i.e., that the video was made elsewhere and then fraudulently presented as evidence at the US Courthouse, Eastern District of Virginia, and also on TV to promote the release of the 9/11 Commission Report. Introduction of fraudulent evidence in the form of a bogus airport surveillance video could not possibly have been accidental, and somewhere along the chain of possession of evidence a link to the praxis of evil will be found. With regard to the forthcoming trial of “confessed” 9/11 mastermind Khalid Sheikh Mohammed, it behooves this court to prevent more Texas justice with Virginia lawyers, to confront the fraud with respect to the purported Dulles Airport video, and to call for a new and real investigation of 9/11 rather than another show trial of a psychologically impaired pawn. 14. I hereby renew and reiterate my claim of an award for having exposed the frame-up and cover-up of 9/11, which claim I made in a fax broadcast to you and the missions to the United Nations here in New York City on 4 December 2009. As a federal judge you are obligated to prevent fraud and force, and you can refer to my fax broadcast now published on my website at http://www.show-the-house.com/id8.html where you scroll to 4 December. My boss, Marion Britton, who was the Assistant New York Regional Director of the Census Bureau at 26 Federal Plaza, was on United Airlines flight 93 on 9/11, and my misgivings about the official story of 9/11 began with the realization that airport surveillance videos of her or of any of the other passengers or hijackers were not made available to anyone under any circumstances. Another Census Bureau colleague witnessed and described to me the bizarre approach of United flight 175 over New York harbor, which I later discovered could not have been accomplished even by a top gun pilot, and therefore could only have been done by remote control. Now I’m showing you that a purported Dulles Airport video surveillance tape, used as evidence by the US Government, is as phony as Osama Bin Laden’s videotaped messages to the world. Please see http://www.show-the-house.com/id92.html. Please do not join the conspiracy of silence! I’d very much like to meet with you to discuss what can and should be done. 15. This 31 December follow-up letter to Chief Judge Preska resulted in my 18 January 2010 receipt of the very same letter returned time-stamped “received” on 5 January 2010 along with a “General Complaint Package” from the District Court’s Pro Se Office dated 15 January 2010. I availed myself of these materials and filed a complaint by mail on 1 February 2010 which was eventually docketed 10-CIV-3908 and is now under appeal in this Court with docket number 10-3022. 16. Incorporating the previous 15 paragraphs of my preliminary statement, my statement of the case now before this Court takes me back again to my boss Marion Britton who is said to have perished on Flight 93 near Shanksville, Pennsylvania on the morning of 11 September 2001. The 9th Anniversary of that day that changed history and the way we live saw many documentaries on The History Channel and I watched as many as possible with rapt attention. But sad to say, the same falsehoods that have been exposed long ago are being retold yet again. I refer specifically to one Deena Burnett. Soon after 9/11 she told the FBI that her husband Thomas called her from Flight 93 to tell her about the hijacking. She was positive about her husband’s use of his cell phone because she recognized his cell phone number on her caller ID screen. Mrs. Burnett was firm and emphatic about this with her FBI interviewers. Yet nine years later she still seems unaware that there is a big problem with her story that she repeated on History Channel. The problem is, completed cell phone calls are impossible to make from a jet at high altitude or high speed. I’m not saying Mrs. Burnett is a liar. She is probably just unaware of the high likelihood that the calls she thought she received from her husband Tom were actually impersonations made possible by a technology called real time digital voice morphing. Likewise were the calls received by emergency operator John Shaw from Flight 93 passenger Edward Felt high tech impersonations. But in this instance the psychopathic criminals made a mistake in their script and gave away their game. Felt repeated firmly and emphatically that he was using his cell phone to call 911 from the toilet near the stern where he had locked himself for protection from the “terrorists.” The problem here is that not only are cell phone calls impossible to make from a jet at high altitude or high speed, but there are no air phones installed inside toilets on jets. So one must conclude there is no way Edward Felt made a call to John Shaw. What John Shaw heard was a not very clever impersonation by a caller using real time digital voice morphing. Even the story about Marion’s phone call lacks plausibility and suggests inside knowledge of our New York Regional Office procedures. But I’ll hold on to that thought at least until I head a new investigation. 17. The point I wish to make out of the foregoing is that the combination of missing airport video surveillance tapes from the morning of 9/11, the introduction of a bogus “Dulles Airport” video surveillance tape by the US Department of Justice, and stories of cell phone calls that are impossible to make from speeding jets at altitude or to confuse with seat back air phones very strongly indicates a design to deceive and to confuse and thereby promote the operations of 9/11. This alone should be enough to warrant a new and a real investigation, but there is so much more! This brief is not the place to attempt an exhaustive list, but at least for now let me give just one more example indicating the scope of operations on 9/11. This example is from my own direct personal observations on 9/11 and the ensuing weeks. Commencing on 9/11 and for about the next 6 weeks I noted a very strong smell like that of an electrical fire which hanged in the air where I then lived on the Upper East Side of Manhattan. Each day I would visit the north end of the Great Lawn of Central Park from where one could view the smoke rising from the remains of Ground Zero more than five miles to the south. Each day I noted that the winds were out of the northwest and carried the smoke like a huge cloud on the horizon to the southeast. Yet this strong smell persisted even from an almost windward location more than five miles away. Neighbors, doormen and merchants in the area share my recollection of this smell and its duration. This smell was of equal intensity indoors and outdoors, and gradually diminished. Later I discovered that such a smell is a signature of a nuclear detonation. So too are the burn wounds sustained by Felipe David in the sub-basement of the north tower WTC1 - moments before the first jet made its impact - evocative of the medical literature from the immediate aftermath of Hiroshima and Nagasaki. Add to this the eye-popping seismic record and the general failure of electronics in lower Manhattan right before evacuation and one can conclude that mini-nukes were used to weaken and then bring down the Twin Towers and the Salomon Brothers Building, WTC7. The news media silence on this telltale smell and so much more about 9/11 is deafening and remains very highly suspicious nine years later. We did not get the real story: the truth, the whole truth and nothing but the truth. Now we can! The bogus 9/11 “Dulles Airport” video surveillance tape is published on the website of the United States District Court for the Eastern District of Virginia at http://www.vaed.uscourts.gov/notablecases/moussaoui/exhibits/prosecution.html where you scroll down to Exhibit NT00211 and click to play and/or download. Analysis of this videotape reveals that it could not have been filmed at Washington Dulles International Airport as falsely stated and maintained by the US Department of Justice, the Defendants-Appellees, but was filmed elsewhere at a time and place as yet unknown. The false statements and misrepresentations of the Defendants-Appellees violate the law as expressed in USC § 35; USC § 371; USC § 1512(c). Given the latitude (38° 57' North) and longitude (77° 27' West) of Washington Dulles International Airport, the north faces of the Main Terminal and the two midfield terminals are always in shadow from the sun, and throughout the day the sun casts shadows away from the terminal entrances and never towards them. Yet in Exhibit NT00211 one can see in the far background of the film, just outside the entrance, passersby who are casting rather long shadows toward the building. One such passerby appears in PHOTO B below. If this film were really a Dulles Airport video surveillance tape taken on the morning of 11 September 2001, then the sun was rising in the northwest. But we all know the sun rises in the east. 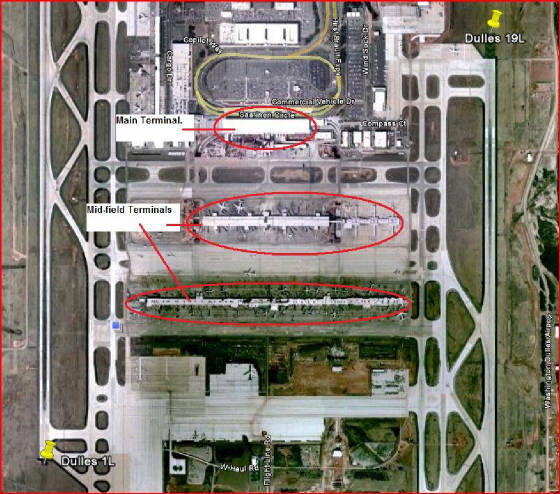 A close examination of the Dulles Airport Main Terminal with Google Earth satellite photography shows that the east, south and west sides of the building are directly adjacent to airport operations areas where there is no public access. 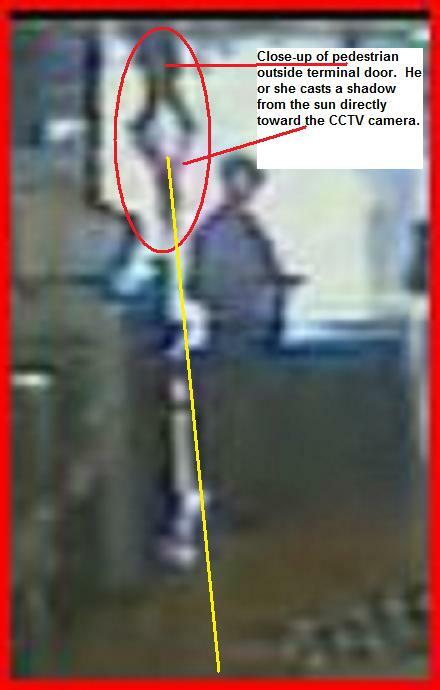 Moreover, the Defendants-Appellees designated this video surveillance tape, Exhibit NT00211 at the Moussaoui trial, the “Surveillance Videotape from Dulles Airport West Security Checkpoint #1”; but even if there were a passenger entrance on the west side of the Main Terminal, the area right outside would be in the shadow of the terminal building from the sun rising in the east, and any passersby would be in the shadow of the building and therefore not casting their own shadows. Even if the sun could somehow shine upon them, their shadows would fall away from the building. In the video, the shadows are toward the building. We are left to conclude that this surveillance video could not possibly have been filmed at Dulles Airport and that the US Department of Justice, the Defendants-Appellees among others, have perpetrated a fraud against the people of the United States and indeed the nations of the earth. Furthermore, we have never seen any credible 9/11 video surveillance evidence of any of the passengers – let alone hijackers – at any of the three “Category X” high security airports from which the flights of 9/11 are said to have originated. These airports were Logan International Airport in Boston, Liberty International Airport in Newark, and Washington Dulles International Airport in Herndon, Virginia. This unexplained lack of routine evidence in combination with the introduction of false evidence strongly indicates a design to deceive and not an accident. Moreover, billions of people were mesmerized by news media images of two suspects passing through a metal detector, but that surveillance video was from Portland Maine International Airport and is fraught with significant problems. Just weeks after 9/11, Afghanistan’s Taliban government made a good faith proposal to deliver to the USA Osama Bin Laden on the condition that the US Government must show evidence of his culpability. The bogus 9/11 “Dulles Airport” video together with the missing surveillance videos from Dulles, Newark and Logan Airports clearly indicate why the US Government lacked the good faith required to reciprocate the Taliban’s reasonable offer. The Defendants-Appellees’ fraudulent use of the bogus 9/11 “Dulles Airport” video indicates foreknowledge and preparation for 9/11. The deception helped to create a pretext for war. Foreknowledge and preparation for 9/11 so as to create a pretext for war are elements of the supreme international war crime which is, according to Principle VI of the Nüremberg Principles, to initiate a war of aggression. Such aggressive war violates 18 USC § 2441, the letter and spirit of Article 2.4 of the Charter of the United Nations as well as our constitutionally mandated treaty obligations upheld by Article IV (the Supremacy Clause) of the Constitution of the United States. Foreknowledge and preparation for 9/11 so as to create a pretext for war also mean treason here at home as per the Constitution of the United States, Article III, Section 3; 18 USC § 2381; 18 USC § 2382; and 18 USC § 2384. In September 2000, Dov Zakheim, who had George W. Bush’s ear as his Foreign Policy Advisor during his 2000 campaign for the presidency, signed onto a Zionist Neoconservative document suggesting that a “new Pearl Harbor” would hasten attainment of their goal of full spectrum US military dominance of the world (See Rebuilding America’s Defenses, page 51 [63/90 of PDF file], published by the Project for the New American Century). Then Paul O’Neill, the Secretary of Treasury in the Bush Administration, heard President Bush order his National Security Council to find a way to go into Iraq at their very first meeting in February 2001 (See Paul O’Neill’s 11 January 2004 Sixty Minutes interview with Lesley Stahl). Then Zakheim, whose background included expertise in remote control piloting of aerial vehicles, became Comptroller of the Pentagon a few months before Secretary of Defense Donald Rumsfeld announced on 10 September 2001 that the Comptroller’s office could not account for 2.3 trillion dollars. Here is where motive, means and opportunity to plan and execute a high tech false flag military intelligence operation converge, and here is where the 9/11 Commission never even looked. The Defendants-Appellees’ use of the bogus 9/11 “Dulles Airport” video surveillance tape is consistent with the planning and execution of a high tech false flag military intelligence operation to create a pretext for war. Such an operation is also consistent with President Bush’s February 2001 order to his National Security Council to find a way to go into Iraq. As indicated in the foregoing paragraphs of this brief, the bogus 9/11 “Dulles Airport” video surveillance tape is the epitome of a high tech – albeit imperfect - false flag military intelligence operation conducted by a Praxis of Evil in our midst. The Plaintiff-Appellant’s discovery of this treasonous, warmongering fraud on the people of the United States and indeed the people of the entire earth should be introduced in an adversarial process where the Defendants-Appellees will be confronted with the evidence and compelled to respond in a reasonable way according to the law and the grave responsibilities of their offices. Because the sun’s shadows cast by passersby seen in the far background of the film do not comport with the US Government’s scenario in terms of time and place, the Defendants-Appellees themselves deserve the opportunity to demonstrate how they could spin the earth so as to make the sun rise in the west, which is the only logical explanation for the shadows if indeed they were filmed at Dulles Airport on the early morning of 11 September 2001. The Defendants-Appellees’ use of the bogus 9/11 “Dulles Airport” video surveillance tape is consistent with the planning and execution of a high tech false flag military intelligence operation to create a pretext for war. Such an operation is also consistent with President Bush’s February 2001 order to his National Security Council to find a way to go into Iraq. In light of these very serious crimes, the Plaintiff-Appellant’s suit should not be impeded by a legal stricture with respect to standing, but should go forward in the best interests of justice and the good name and national security of the United States of America. In this unique and compelling circumstance, where the Plaintiff-Appellant is quite alone in making his discovery and accusation against the chief law enforcement agency of his nation and in the face of a conspiracy of silence and of shunning, shouldn’t the status of proper standing devolve upon him as one of the unspecified rights guaranteed by Amendments IX and X of the Constitution of the United States? Is this not a simple matter of a natural right to hold his government to account for serious wrongdoing when no one else will? The wise advice seen on New York City subway posters to heighten security awareness - “If you see something, say something” - goes to the heart of the matter. Herein is the essence of what promises to be a landmark case of a solitary citizen standing at the gates of justice and shaking the nations of the earth from very strong delusion about 9/11. But what kind of jurisprudence denies a watchman’s approach, let alone his warning? In a very real sense all citizens who see something and say something have standing and a corresponding natural right to a responsive government. Amendments IX and X of the Constitution of the United States guarantee that no law or statute or decision can deny the Plaintiff-Appellant’s right to a responsive government, let alone reasonable relief that leads in this case to exposure of treasonous, warmongering fraud and rewards his vigilance and perseverance against all odds. ● Order the Defendants-Appellees to award the Plaintiff-Appellant the sum of $50,000,000.00 for his discovery of a conspiracy to commit fraud in the furtherance of treasonous acts perpetrated by an enemy within, a Praxis of Evil whose purpose is to wage aggressive war in violation of the letter and spirit of international law, particularly the Nüremberg Principles. Such an award is commensurate with previous offers for the capture of other 9/11 suspects “dead or alive” and should not be confused with compensation for actual damages. Actual damage was done to the good name and integrity of the United States of America, and inasmuch as the Plaintiff-Appellant is a citizen of the United States of America, he has sustained such actual damage for which no price can be paid. The Plaintiff-Appellant here adds that he is at the service of his nation to conduct a new and a real investigation of 9/11. The main duty of judges is to prevent force and fraud. The Defendants-Appellees need to choose: do they still go forward with the “Dulles Airport” video fraud, or do they take proper measures to deal with this fraud and all its implications and consequences? Establishment of judicial evidence with respect to their bogus “Dulles Airport” video surveillance tape will force them to choose one or the other. In his 29 January 2002 State of the Union speech President Bush observed: “Those of us who have lived through these challenging times have been changed by them. We’ve come to know truths that we will never question: Evil is real, and it must be opposed.” Indeed! Surely the chain of custody of evidence for the fraudulent “Dulles Airport” surveillance video tape will lead a new and a real investigation directly to the Praxis of Evil in our midst which actually pulled off 9/11 and framed certain “likely suspect” Arabs for these heinous crimes. A gambler’s illusion has eclipsed our national sovereignty and bound the people with strong delusion; however, science uncovered the deception, which this Court must uphold. Now the Plaintiff-Appellant is at the threshold of compelling a legal discovery process and achieving closure not just for himself but for countless other people around the world who have been adversely affected by the events of 9/11 and who deserve to know the whole truth and nothing but the truth about what really happened. The Plaintiff-Appellant humbly and thankfully awaits this Court’s consideration and judgment. Because there were no known proceedings in the District Court involving the Defendants-Appellees in this action prior to Chief Judge Preska’s sua sponte civil judgment and order of dismissal, there is no transcript of proceedings or agreed statement of the record on appeal. Therefore, the Plaintiff-Appellant believes that in this case this Court has a tabula rasa for creative and innovative solutions. Furthermore, given the global implications of dissolving a very strong delusion about 9/11 and the real reasons for the carnage and destruction in Afghanistan and Iraq, the Plaintiff-Appellant also believes that this Court should consider this brief en banc. The Plaintiff-Appellant respectfully asks that this Court adjudicate this matter forthwith by establishment of judicial evidence with respect to the Defendants-Appellees’ bogus 9/11 “Dulles Airport” video surveillance tape and to grant the relief demanded in the District Court; or if this Court is not inclined to do so, that it should remand the case for a fair and impartial trial before an unprejudiced jury on proper evidence and under correct instructions as the law may deem just and proper.